Metallica Worldwired x 2 seated tickets for Warsaw stadium, 21th August 2019. 2 x Ticket. Seats 294-295. Jason Newsted threw it into my baseball cap after he used it. Has been in my personal guitar pick collection for over 30 years. At Parade Records we pride ourselves on providing high quality vinyl/CDs, and a friendly and professional service. EX - Excellent– Used And With Minor Signs Of Wear. Metallica Helsinki night 1 numbered poster. Original Metallica 2003 2004 Concert Programme Tour Book with Slip Case. Condition is Very Good. Dispatched with Royal Mail 2nd Class. 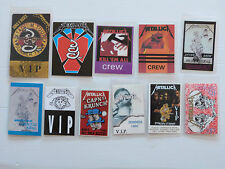 DONNINGTON FESTIVAL GUEST PASS: 1985 ZZ TOP METALLICA. Fully Intact Super Rare. DONNINGTON PARK. Rectangular printed red & white guest pass bearing "Eliminator' car artwork of Donnington headliner ZZ Top, printed on waxed paper card. Excellent condition with light centre crease and tiny pin holes at top and bottom. Warrant were supporting David Lee Roth. Erik Turner threw it into my baseball cap after he used it. Very slight wear to edge due to Erik Turner using the pick during the concert. The back of the guitar pick bears the words "Eric's Cherry Popper" (a misprint of the correct spelling of "Erik"). METALLICA - CASTLE DONINGTON MOR 1991 -25 ORIGINAL LIVE CONCERT PHOTOS 6" x 4"
Set of 25 photos, all 6" x 4" in size. Diamond Head- Signed Promo Pack,Programme, Fan Merch Sheet. Good signatures on the pack, there are storage marks on the front and back. Merch sheet and programme in good condition. Is it evil yes it is! METALLICA - CASTLE DONINGTON MOR 1991 - 25 ORIGINAL LIVE CONCERT PHOTOS 6" x 4"
Metallica Through The Never Promo Poster RARE LIMITED EDITION. this poster was a limited edition, which came with pre-orders of the movie! Numbered 82/100 Condition is Very Good. Dispatched with Royal Mail 1st Class. Set of 17 photos, all 6" x 4" in size. Artists : Metallica, Marilyn Manson, Placebo and many others Venue : Milton Keynes Bowl Date : Saturday, 10th July 1999 Additional info : Original blue / white Handbill Flyer measures 7 1/8” x 5 7/8”. ‘Big Day Out Festival’. Condition : Excellent. Please refer to photo. I have added many more original concert tickets that are now for sale on the fincharie website. Please visit and follow the link. Please check out the fincharie website for many other Beatles, Rolling Stones, Pink Floyd, Cream, Eric Clapton, Paul Weller, and many other artists memorabilia items from the 60's to the current day that are now up for sale. Thanks for looking and happy bidding. THESE GORGEOUS SWEAT BANDS ARE IN NEAR MINT CONDITION HAVING NEVER BEEN WORN OR WASHED! THEY ARE RED IN COLOUR AND ARE ‘ONESIZE’. Major restoration needed. Ex = shows little or no sign of any wear and tear. 2 Metallica Tickets 13th Of March Van Angel Arena Michigan. Condition is New. Dispatched with Royal Mail 1st Class Letter. 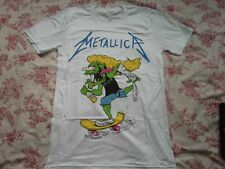 2 x Metallica The Shortest Straw Package Ticket for Slaine's Castle, Ireland on. Condition is New. Dispatched with Royal Mail 2nd Class. THIS STUNNING RARE WRIST BAND IS IDEAL FOR FRAMING OR WEARING. Ex = shows little or no sign of any wear and tear. Although it has been opened and used it is complete and intact. Almost new. Ex = shows very minimum signs of ageing and wear and tear. CAN ANYONE HELP???. Ex = shows little or no sign of any wear and tear. Although it has been opened and used it is complete and intact. Almost new. Ex = shows very minimum signs of ageing and wear and tear. Ireland Metallica, Tickets, 2019, SLANE CASTLE, GA Tickets Hotel Stay 8th June! Ticket stub from Donnington Concert 26th August 1995, included is the coach ticket from Halifax bus station. SIZE - 360mm x 280mm (14" x 11"). Full Page Newspaper Advert promoting the iconic UK Concerts. Metallica Slane Ticket. Gold Circle X 2. Condition is New. Dispatched with Royal Mail 2nd Class. 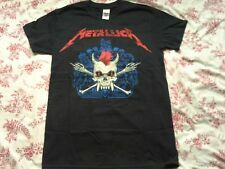 Metallica -Ultra Rare - London - Shoreditch PopUp shop - 2017 tour T-Shirt. Size Medium Condition is New. Dispatched with Royal Mail 2nd Class. METALLICA - VERY RARE 1993 UK TICKET STUB NATIONAL BOWL MILTON KEYNES. Condition is Very Good. Dispatched with Royal Mail 1st Class. Metallica - Slaines Castle 8th June 2019 . Slane Castle, Dublin - 8th June 2019. Fully laminated repro concert ticket from the original on quality 190gsm card. Dublin,Ireland. This is a one sided quality repro and is actual size of original ticket. The Point Theatre. Picture below shows the actual ticket you will recieve. Fully laminated repro concert ticket from the original on quality 190gsm card. Dublin,Ireland. This is a one sided quality repro and is actual size of original ticket. 3rd October 1988.